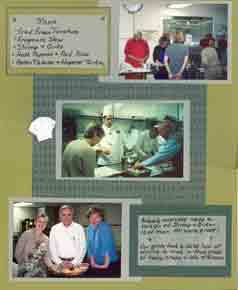 What a wonderful way to honor the person who taught you to cook by mixing up some Recipe Scrapbooking. Not only scrap the recipe itself as the main entree', but add in side dish photos of the cook, the dish and special family occasions where the dish is traditionally served. Then for Dessert, add a finish of journaling for just the right ending to remember those great family times that are so often surrounded by great food. For really great Recipe Scrapbooking, don't forget to Journal about when and where the recipe came from. Who first used it to cook with? Was it by chance only in the mind of the cook and someone later had to write it down? For how many generations has it been handed down? For the Recipe itself - Do you have the original recipe, perhaps in your grandmothers handwriting? Is it stained or soiled from repeated use? Scan it and preserve it like it is for use in your Recipe Scrapbook Layout. Or, copy it over in your best handwriting on a recipe card. Use a pre-printed recipe card, or make your own using stickers or rubber stamps that match an ingredient in the recipe. Or, type it into the computer and print it out in a fancy font that you think goes with the recipe. If the recipe from England - use an old English font Calligraphy. If the recipe is a Halloween Treat - use Candy Corn. If therecipe from Germany - use a Gothic Style font. Whatever font you use, keep the same one for journaling on your page to tie the entire layout together. 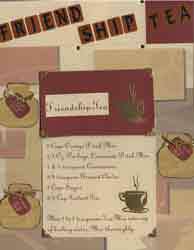 Check out our Kits & Supplies from the Store for Recipe Scrapbooking for some great tips on how to Pick an Album, Layout your Pages, Proof reading the Recipes and Purchasing some supplies to make a wonderful Recipe Scrapbook. 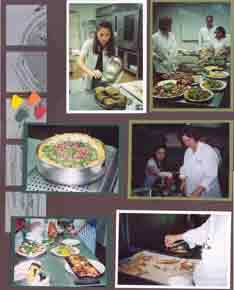 Have you attended any cooking classes? Did you remember to take photos? If so great, it not, don't despair, you can always take photos the next time it's cooked. If you attended classes, were your teamed up or partnered up with someone, or were you on your own? Did you learn one dish at a time or an entire menu for a specific type of meal? Want to Put Together a Digital Recipe Scrapbook with a Quick Tutorial? Looking for some Scrapbook Kits, Books or Embellishments for your Own Layouts? Click here to check out our Recipe Scrapbooking Store. 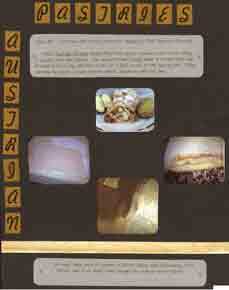 Here Are a Few Layouts to Get You Started on Recipe Scrapbooking. The recipe on the left is not my family recipe, but I did get it years ago from the White House web site. It's for Mrs. Laura Bush's Hot Chocolate and ever since we first tasted it, it has become our family recipe. Pinch of Cinnamon Powder (optional), Whipped Cream & Orange Zest. This is a wonderful taste and reminds me of the wonderful orange chocolates available only around Christmas. 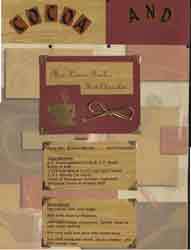 The Recipe Scrapbooking Layout on the right is from a friend of mine who made some Friendship Tea for Christmas gifts that same year. I got the recipe from her and the next year gave out little jars of the tea as my own Christmas Gifts - complete with a little tag on each jar with the recipe tucked inside and tied on with the same gold cording used on the scrapbook page. Mix 2 to 3 teaspoons Tea Mix into cup of boiling water. Mix thoroughly. Both of Recipe Scrapbooking layouts above were made with a new paper at the time that I had received from ClubScrap.com that goes back several years to a kit known as "Mocha Java." It was so popular they made another kit for special purchase in 2007 called Mocha Java Remix. Here is a little different Twist. On Lemons! I have a great Lemon Meringue Pie that was a family favorite, but no one could remember where it came from. It was just always there in the recipe box. Since we had no history and no photos, I decided to twist the phrase, "When Life Gives You Lemons" (using lots of small photos of Lemons) and ended the phrase with "Make Lemon Meringue Pie" instead of "Lemon-aid." 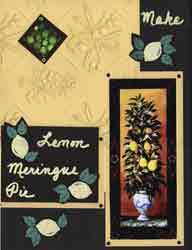 For this Recipe Scrapbooking Layout, the recipe was typed up and to see the recipe, you lift up the black card with the lemon on it and the recipe is underneath. 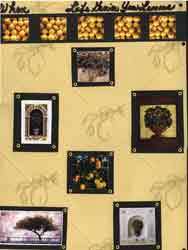 I was just lucky that I had that wonderful card stock in the light yellow with the embossed lemons and some rubber stamps of lemons that I could ink and emboss to go on the layout. Again, all of the ingredients above came from ClubScrap.com and the Tuscany kit issued in October 2002. These two Recipe Scrapbooking Layouts above use the Paper and some embellishments from the Club Scrap January 2007 kit called "Fizz". These photos of the day we made and ate 12 flavors of Ice Cream at Johnson & Wales, just seemed to fit the fun of this pink and white paper. Some of the photos are double matted in a light pink and dark pink. Since several of the flavors we made were Strawberry, Raspberry, and Cherry - I was trying to carry the theme of the flavors through to the layout. On the left pages are two short pieces of black & white dotted ribbon. That dotted theme for the embellishments was carried over on the right hand page in the three circles on the right. The top circle has some journaling - "Never be Caught Without a Spoon" the name of the Layout. Why that name? My best friend spotted me in the car on the way home with 12 gallons of ice cream and I wanted to give her some, but we had no spoon. This layout helps me remember the laughter we shared over that. The second circle has a round cut piece of black dotted mesh and the third circle has a large pink & white button in the center. Other Embellishments include pink brads on two journaling cards. The journaling is placed everywhere - in the circles, as a list, under the photos and even on the sides of photos. The layout is a little busy for my taste, but it expresses the fun we had that day and the many kinds of ice cream we made it home with. The recipes are tucked under the pink strip on the right. 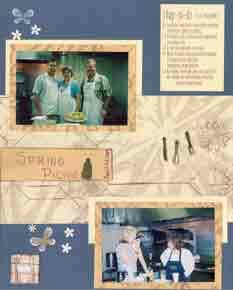 The paper, eyelets, lettering and small frame in this Recipe Scrapbooking Layout were all from the Club Scrap March 04 "Culinary" Kit. The two embellishments of the Chef's hat and the denim Apron were from Jolee's. 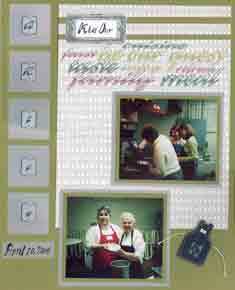 The cooking class that day was all about Grits - good old Southern Grits, so the layout title is "Kiss Our Grits" with the word Grits spelled out with one letter in each silver square down the left side of the layout. At the top of that page, just to the right of the "G" is a little embellishment frame with the words "Kiss Our...". At the bottom of the left side strip, is a small journaling block with the date in the same font as the Title. The days menu for what we were preparing is on the Journaling Block on the right side, matted and attached with eyelets in the corner. 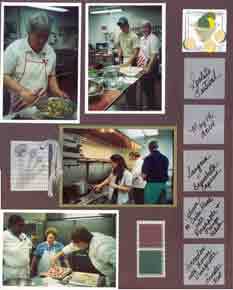 The recipes are on cards tucked under the center photo on the right side. Being Southerners and Coastal, each team of 2 picked Shrimp and Grits to make. Each of the 12 versions of the Shrimp and Grits, all from the same recipe, with assistance from the same head chef, tasted entirely different. No wonder we could never make that dish like our Mother-in-law! The papers, lettering, and one journaling block for these Recipe Scrapbooking Layouts above came from the Club Scrap Kit from March 2007 called "Rhapsody." 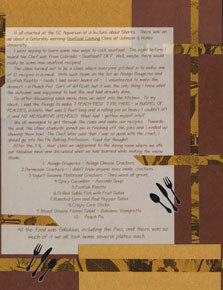 This layout called Spring Picnics was from a cooking class with the menu of new foods to take on a Picnic. 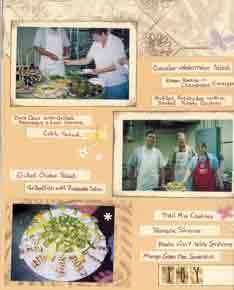 All journaling was hand done, and consists of strips of paper, each with the name of a dish that we prepared scattered abound the page, near the photo of the finished dish and the preparers. The Journaling card on the upper right of the page, is actually the definition of the word, Rhapsody, straight from the kit, but it fit perfectly with the great food that we prepared that day. The other embellishments of flowers and butterflies scattered around the page seemed more fitting than the typical ants you have to worry about at a picnic. They are from Jolees as is the little fabric place mat with the knife and fork in the lower left hand page and the Knife, Fork, and Spoon charms hanging from the brads on the right. 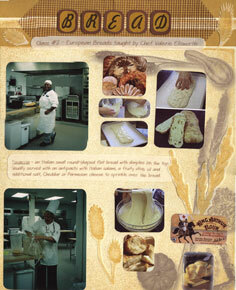 These Recipe Scrapbooking layouts are all about the day the class learned to make Breads. The layout uses paper that has wheat stalks cut from a vellum paper with the wheat stalks printed. They were cut from the full page and scattered around the layout. 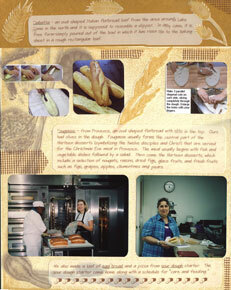 The photos are of the various steps used towards making bread from scratch; and the recipes are tucked behind the layout itself and are for several kinds of bread, all from the same original starter recipe. The photos on these pages were many different sizes - some just to show a part of the technique - others to show the shape of the different breads. The journaling blocks, printed on vellum, list each type of bread, and what makes that bread special and how to adjust the original bread recipe to make it. I didn't get many photos of this class, I was so stunned at what I had to do. We had a huge menu and everyone else had participated in the classes before, so they all got dibs on what they wanted to make. 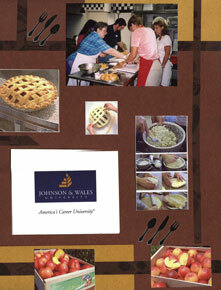 I wasn't planning to do any recipe scrapbooking layouts for this set of classes. I had enrolled for a seafood cooking class and ended up with the item no chosen by other to make - a Peach Pie. No, I correct myself. 15 Peach Pies!!! See those crates of peaches there. Thanks goodness, I already knew how to make a pie crust! But with the lack of photos, I needed something to put on the other page, so I filled up the other page with journaling. I listed all the menu items, and journaled about making all those pies. The journaling was done on the computer and printed on vellum. After re-reading the journaling, I can remember how tired I was, but was also pleased that chef said I was a good pie baker. This next class on Cookies was about Spring Cookies instead of Holiday Cookies. I always get with a group after Thanksgiving to make and trade cookies, but this was different - we were doing it in the Spring. The Recipe Scrapbooking background paper was a light blue floral pattern with a lot of white in the background and I matted some of the photos, cut into different sizes and shapes, on solid blue mattes, the same color as the background. There was a lot of blue in the photos, from the clothes to the icing on the cookies. In order to dress up this page, I put a few blue sequins onto the center of the flowers in the background paper and a few stickers from Jolee's of some cookies in a box and cookies on a cookie sheet. 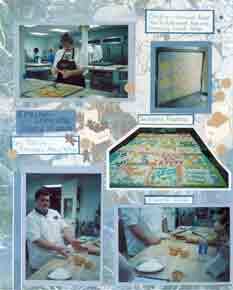 These Recipe Scrapbooking layouts above are using Club Scrap Culinary Kit from March 2004. I have journaled in each of the silver blocks on the right, each item on the menu. I used a burgundy background and used silver for photos mattes that matched the silver squares on the side. I also used a little light green for photos mattes. I tried to crop the photos small enough to fit all of them on the page and not cover the borders on the outside edges. 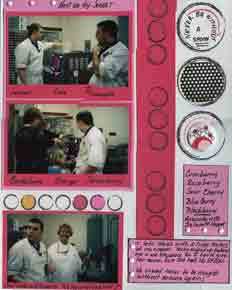 I thought the Recipe Scrapbooking layout was a little drab, with only the burgundy and silver, it needed some color. One of the menu items was Citrus Chutney, so I used the little colander and little lemons and limes for an embellishment on the far right. The other page had a dish made from red, green and yellow peppers, so I used those for an embellishment next to the photo on the far left. This just goes to show you that you can find absolutely anything in scrapbooking supplies. 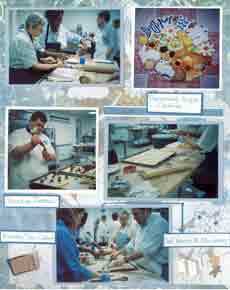 These Recipe Scrapbooking layouts above were from when we spent the day making Austrian and Greek Pastries. The photos on the left were basically some techniques on stretching the dough. The ones on the right were some of our final products. 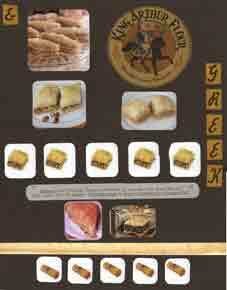 The little photos across the middle of the page were various shots of the Baklava we made - 6 different kinds. The journaling was done on the computer on vellum that was cut into strips, had the corners rounded, to match all the photos on the layouts. The vellum journaling strips were attached with eyelets on each end. The gingerbread house Recipe Scrapbooking layout, done at Christmas time, I treated a little differently. 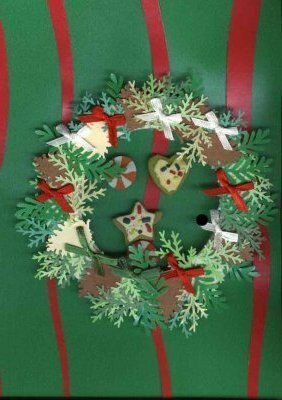 Using the traditional holiday red and green, I alternated the background colors and embellishments making wavy strips to resemble streamers coming from the top of the page. Since I had the little Jolee's stickers of gingerbread men cookies, I used them to scatter about the layouts. I really needed a few more photos, but the folks at this class were really shy about the camera. Still needing more on the layout, I punched out several green Christmas trees and put them in a row along the bottom of the red page. Here is a close up of the journaling block for this page. Since there were about 12 teams making houses, we kept joking about the sub-division we were building. That was my cue for journaling! 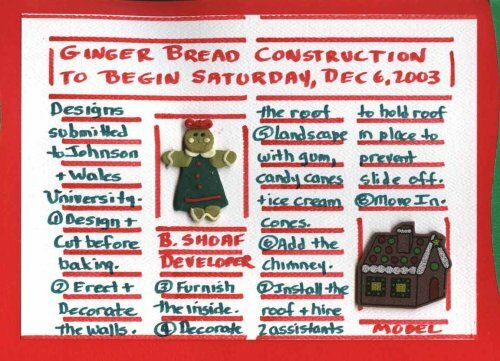 As were learned what steps to take to make the best and sturdiest house, I turned that into a newspaper type headline, and instead of the news about the Gingerbread Sub-Division, I used the newspaper headline format to detail the basic instructions. The recipe for the royal icing that holds the houses together is under this journaling block. The shaker box was decorated to look like a Christmas Wreath. A shaker box is made of two layers of foam tape with a clear plastic sheet placed on top of the thicker bottom layer and attached with the tape from the top and thinner layer of foam. Normally a shaker box would be filled with tiny loose materials that move within the shaker box. 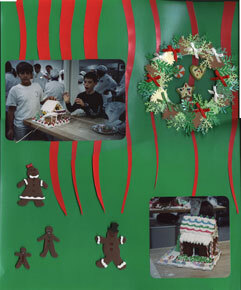 In this case, I used replicas of the candies we used on the Gingerbread Houses, and glued them down. You can use a shaker box with any Recipe Scrapbooking layout. I decorated the shaker box on the outside with punch outs of leaves from several colors of green paper, tiny brown pine cones, and red, white & green bows to make it resemble the Christmas Wreath. More Recipe Scrapbooking Layouts Soon! Contact Us, If You Would Like to Have Us Post Some of Your Recipe Layouts. and to purchase Books & Kits.